Back in the early days, when I was just beginning to write illustrated articles on the web, I submitted three articles to a political magazine’ in Canada. One of them dealt with corporate control over the mapping of the entire Human Genome System, which was in the process of being patented for the corporate privatization of every physical-part of any human being. The project above was the rough-sketch for the illustration that would have been done had the magazine decided to proceed ­ they declined. But corporate projects throughout different aspects of our lives proceeded, very quietly, to the point that people actually no longer still own their own blood or their own bodies: This semi-classified secret has not been talked about much, but it’s still being worked on to decide how best to take full advantage of the theft of the contents of the bodies that we live in—but which have now been privatized for commercial profits by the same global corporations that are asset stripping the entire planet. 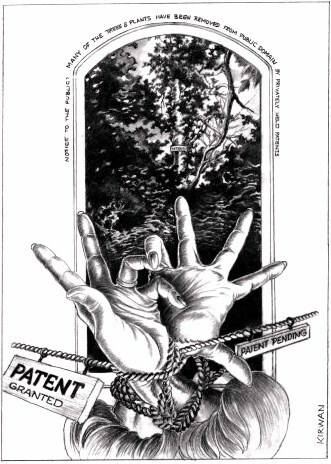 A second article was also submitted concerning the Corporate Patenting of many parts of Nature, because that too had already been done to give exclusive use of various trees, grasses, seeds, plants and herbs directly to the private global Corporatocracies that have been using them for things like Monsanto and other artificially created parts of what once belonged exclusively to nature and to all of us. This was the case until the traitors in the US Supreme Court allowed the global-corporations to own most if not all of nature, for fun and profit. That article too was declined, without comment. 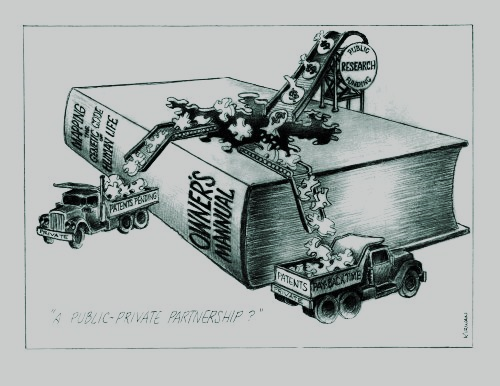 The third part of the series dealt with what was corporately being done to the publishing, film and advertising industries that had just had their copyrights stolen to create the monstrous new corporation: “Time-Warner”. This took place in tandem with Ted Turner who had strangely announced that he wanted to own every image that had ever been published (so no one on the net could use any previously published works without permission) ­ as he sought to privately control the distribution of every image (on the planet) as his private and exclusive property. 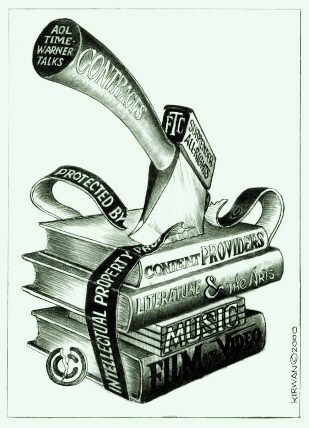 This was taking place during the Library Wars that were being fought out nationally around the San Francisco Public Library ­ when the tech world was seeking to scan every book and every collected image, in existence, into the system ­ which was fought and defeated in many ways for about four years, until we eventually lost to the moneyed interests that now own SFPL. The Plunder of the San Francisco Public Library. The effort to steal all the published images on the planet by Ted Turner turned out to be far too costly and eventually failed, as did “Time-Warner”, which eventually had to be dissolved. No one in the colossal fraud of Time-Warner was ever punished for the criminally stolen copy-rights of millions of artists, film-makers and writers that were victimized by corporate carpet-baggers that had raided the professional careers of millions who suffered financially and creatively from the attempted hijacking of their work and their artistic professions. The above is ancient history now - but even if you’ve never personally heard about any of it, we’re all still facing an even greater series of crimes that surround ‘human thought and the freedom to create new ideas’ from our thoughts or even thought-forms that could free us all from this world of slaves and tyrants, worldwide. As the filthy global-corporations have begun to sense the rebellion that’s coming; their latest form of attack is to copyright creative thought itself and thereby prohibit any and all “thoughts” that have not been pre-licensed. In this the corporations have nothing invested, yet they can demand that those of us who think, can only do so if we pay them for the privilege of using our minds or our skills. Where every individual must have permission to live or think to create within the lives that each of us was born with. This latest corporate crime would force those who can and do create new images or thoughts must now pay to think those thoughts ­ and since the costs will be prohibitive to all except the global-corporations—anyone can easily see where this is leading. The solution is simple. These global corporations need to have their charters burned and have all their “artificial corporate-rights”, illegally granted by the traitorous U.S. Supreme Court ­ revoked. We have officially ‘lost our collective minds’ when it comes to having allowed obscene and unqualified courts to create wholly-new rights for artificial human constructs, such as privately owned corporations.